Foresight creates new knowledge about the futures. One way to examine this is with the phases and contexts described in the SECI-model (Nonaka et al. 2001). The phases of the SECI-model are Socialization, Externalization, Combination and Internalization and the related contexts (called ba) are Originating, Dialoguing, Systemizing and Exercising ba (figure 1). 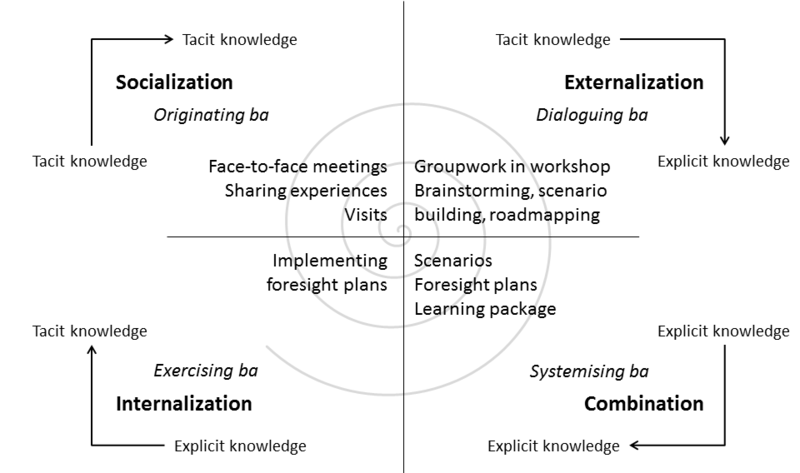 New knowledge is created in a spiral comprising of socialization, where people share their tacit information through face-to-face interaction, externalisation, where tacit knowledge is converted to explicit knowledge through eg. metaphors, combination, where explicit knowledge from different sources is synthesised to form new understanding and internalisation, where explicit knowledge is embodied through practice. These phases take place in the physical, virtual and mental contexts called ba. The model emphasizes openness, trust and motivation for sharing and receiving knowledge. Ba is a temporary common place for exploring new insights, learning, socializing and developing new ideas. It can be a physical space, such as a conference room, cafeteria, office; a virtual space, such as email, video conference, discussion forum; or a mental space, such as shared ideas, common values and mental models. Creative chaos, suitable ambiguity, empathy, caring and commitment enables the strengthening of ba. The successful application of the SECI-model requires solid and systematical facilitation.